Have you long been mulling over how to breeze some new spices into your beauty routine and why not, do it in a way as to pull a rabbit out of the hat? The agenda for today is to zero in on your nails that might have passed through some pretty ombre techniques, negative space designs or silver sparkle magic or maybe the Korean shattered glass effect. Yes, you might have undertaken a bevy of experiments with your fingernails, but we offer you to give a try to our abstract artistic nail art designs that happen once in a blue moon, maybe and are to lead you to the world of abstractionism, full of geometrical shapes, forms, lines, splashes of color and just otherworldly psychedelic images. Some of these elaborate nail art designs are hardly to incorporate into DIY stencils as they do require some amazing painting skills. After all, you are to continue what once started such great abstractionists as cubist Pablo Picasso, geometric abstractionist Wassily Kandinsky or Kazimir Malevich, the author of the much-buzzed-about “Black Square’. Whether you are on the level of a painter or are going to make an appointment with your talented nail technician, any of these 15 abstract nail art designs will require many hours of patient sitting. Amidst tons of paintings anyone can effortlessly identify the style of the Spanish painter Pablo Picasso, the cofounder of cubism movement, who had great passion for dismembering human bodies on his canvases, making them collages with great focus on asymmetrical and bizarre eyes. 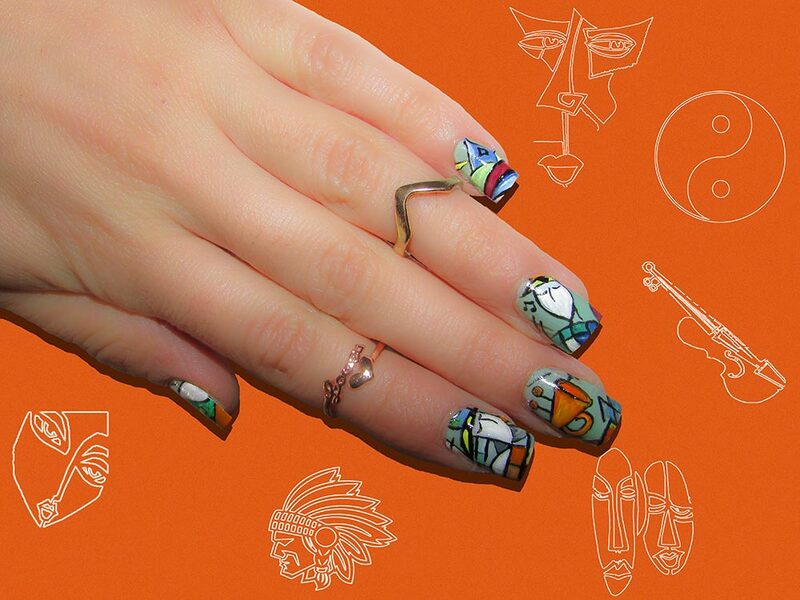 To pay homage to the unique aesthetics of great Picasso, bring together yellow, orange, salmon pink and red nail lacquers ” in a nutshell, as many vibrant shades as possible and depict some abstract collages on each of your nails always with a penetrating eye somewhere, while making the pinky a haven for a closed-eye half face. Psychedelic waves on your fingers, thereunto all wrapped in vibrant and jewel shades, might bring some effect of trance to any viewer. 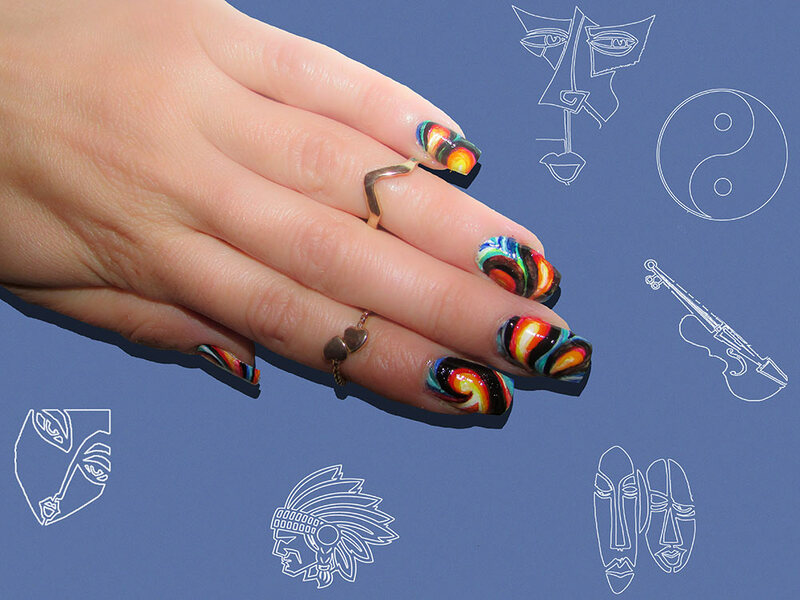 Coat all your nail plates with iridescent stripes using yellow, orange, red and muted blue, then start drawing some black helter-skelter waves onto the colors with an ultra-thin brush. 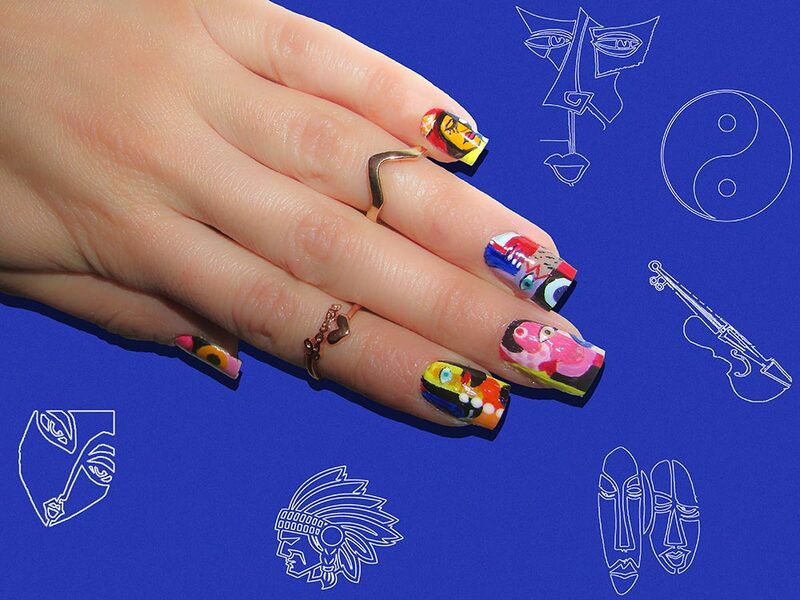 Running a jazz music concert right on your fingernails has now become quite possible. 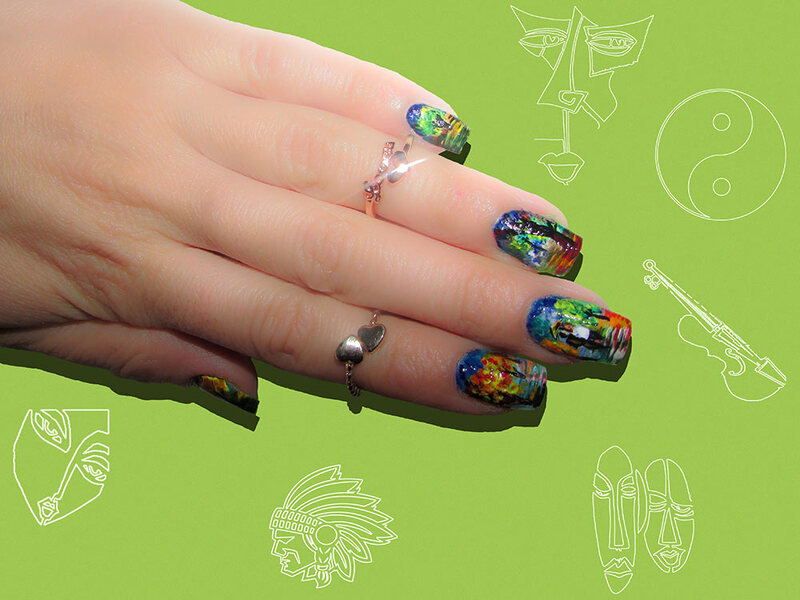 To emulate this abstract nail art design, start from coating the nails with myrtle green shade and then reach out for help to the geometrical abstractionism of the Russian painter Wassily Kandinsky. Depict a playing half trumpet on the center finger and two geometrical human figures deeply enjoying the trumpet chords. The next abstract artistic nail art design we bring to your attention is far cry from being anything enlivening or mood-boosting. Just on the contrary, it is surely to bring some chagrin around thus being a perfect means to express your doldrums. Just coat your nail plates with white polish, then buckled down to splash out some black polish on some of the nails to make them trickle down as if mud. 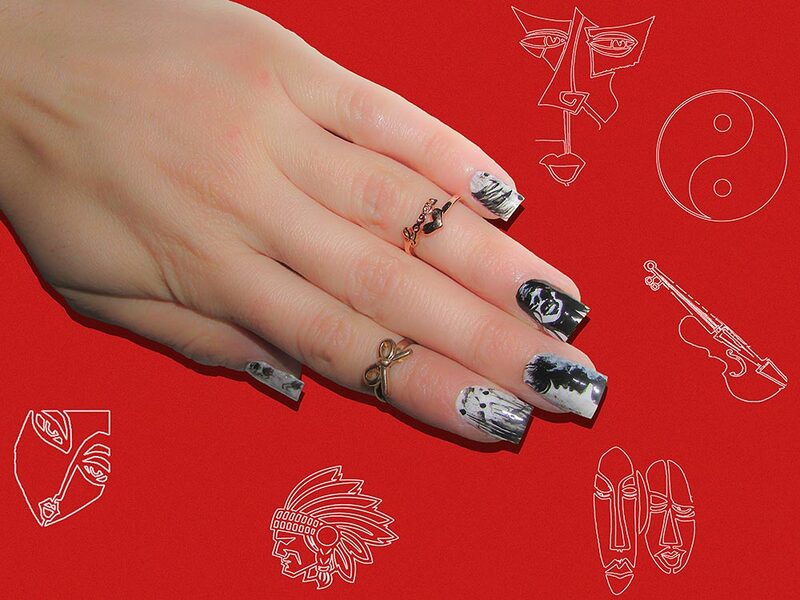 Make another nail dreadful with a black ghostlike image while leaving the center nail for a feminine face in profile. Solving a Chinese puzzle requires some mental job and finger movements but you can concoct a puzzle by yourself right on your nails albeit without any possibility to solve it. 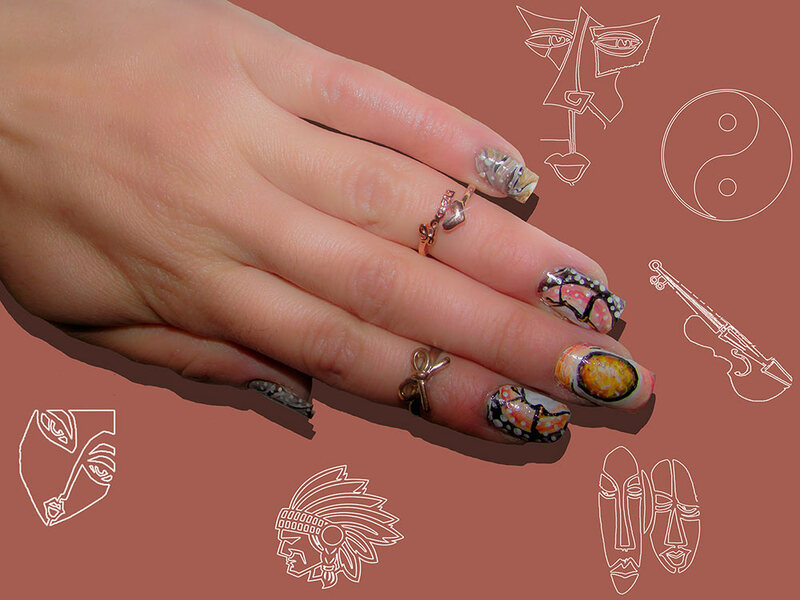 Bunching together some vibrant and muted paints, illustrate many bizarre fragments on all your fingernails with the center finger showing off an image of a man as a sample of already solved puzzle. 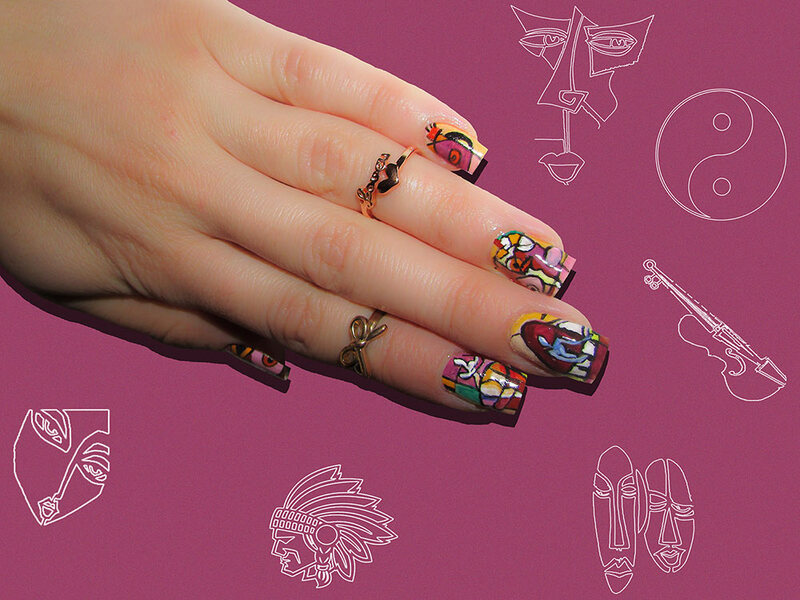 Whether you are a musician or just a fervent music lover, you can surely pay a tribute to your musical predilections right on your nails. 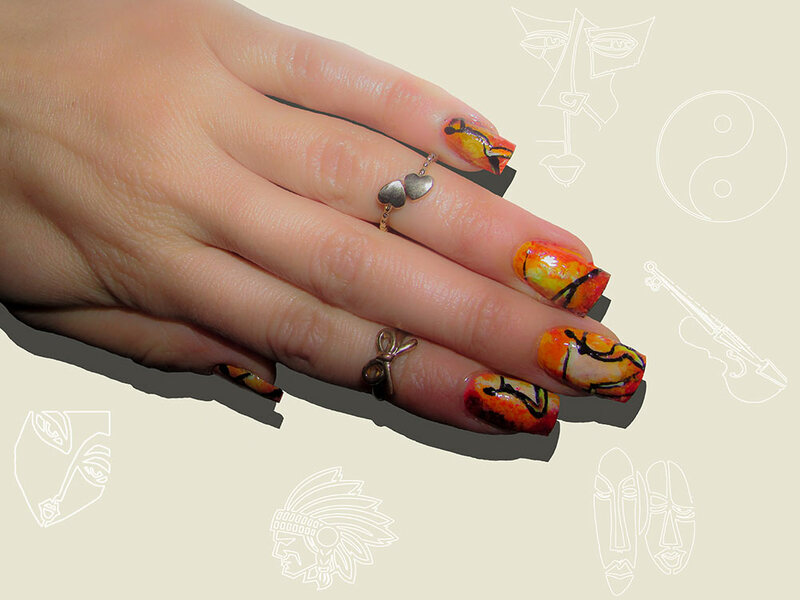 Dress your nails with yellow sleek coat with some orange accents in between and use black paint to morph the nail plates into realistic music notebook. Decorate one of the pages of the notebook with a big lovely butterfly just to show how music chords bring butterflies in your stomach. The next abstract nail art design on our list will best work in winter when it is heavily snowing. But illustrating an abstract snowfall is no piece of cake. Before sealing white polka dots with a stick, you would first need to portray hallucinogenic leafless trees and warm flaming parts up to engendering a blazing fireball on the center nail plate. Watch out here! 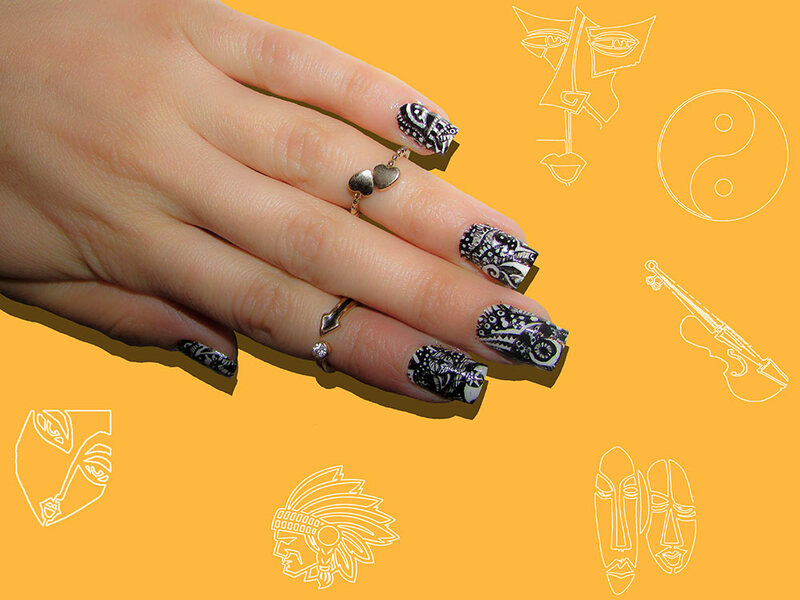 Bringing black and white optical illusion scenes on your nails might not only frustrate the others staring at them but yourself as well. However, the amazing result is worth it. Just acquire black and while acrylic paints and a very thin brush and fling yourself into miniature work, illustrating any forms and shapes that come to your mind, overlapping them and making denser and denser. 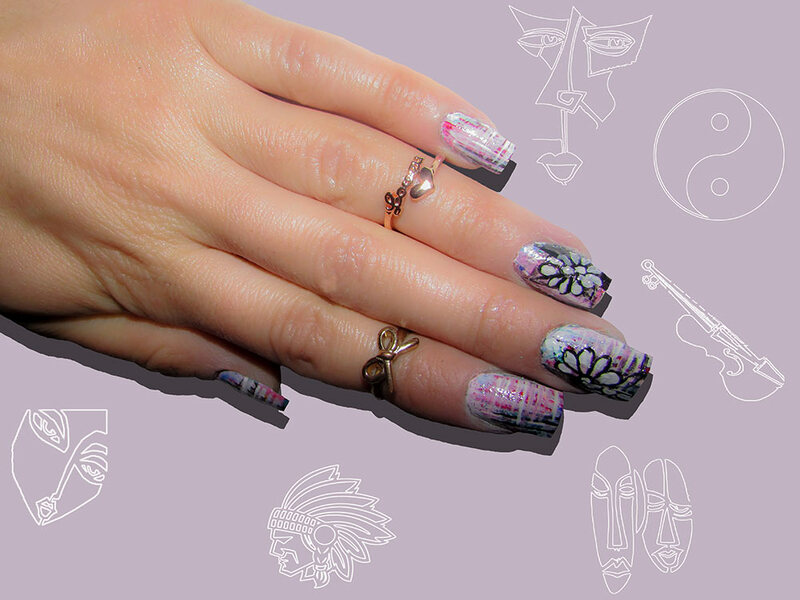 Here is another kaleidoscopic abstract nail art design to blow many minds out there. This swirling colorwork gives the green light to use your imagination to the max. Put together all the enlivening colors like red-orange, dodger blue, yellow and black and use your stick to make as many swirls as are necessary to expand your consciousness. You are free to use the colors we offer or else choose any other bunch to your liking. Just to make a lovely combination of abstractionism with romanticism, throw a glance at this mind-glowing scene. Fancy your nail plates to be real canvas where a loving couple is sauntering along a pavement at rainy night under an umbrella and with many trees aligned lengthwise. Yes, to bring to life that amazing scene you should definitely be on one plane with a real painter. 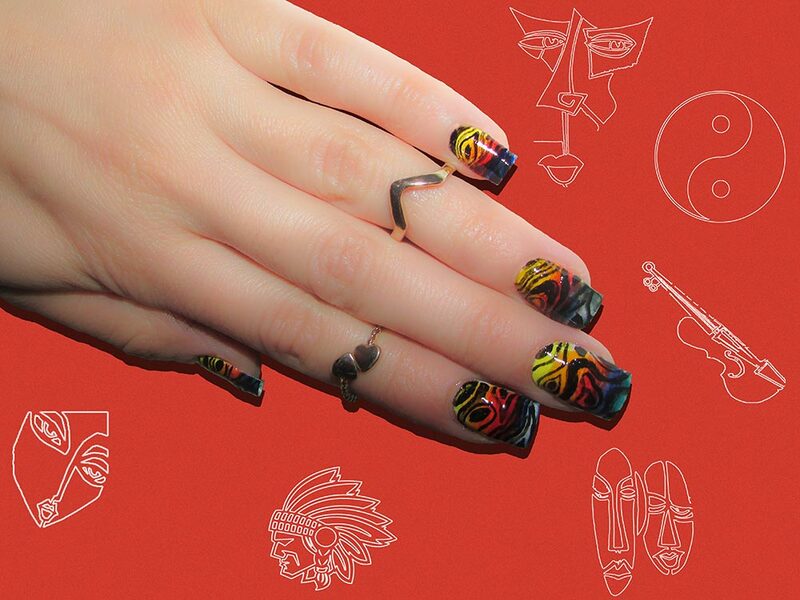 This hallucinogenic nail art design might ring a bell with some of your nightmares with many come-and-go dreadful faces. 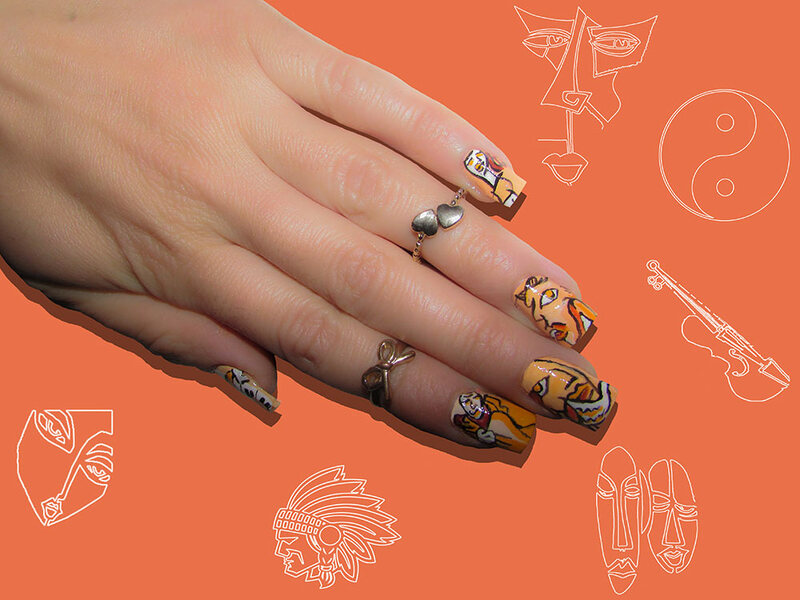 Coat all your nail plates with a sweet peach polish and using the brushes, portray bizarre faces with one evil eye or grinning sinisterly. There seems to be no lull for lovely flowers. 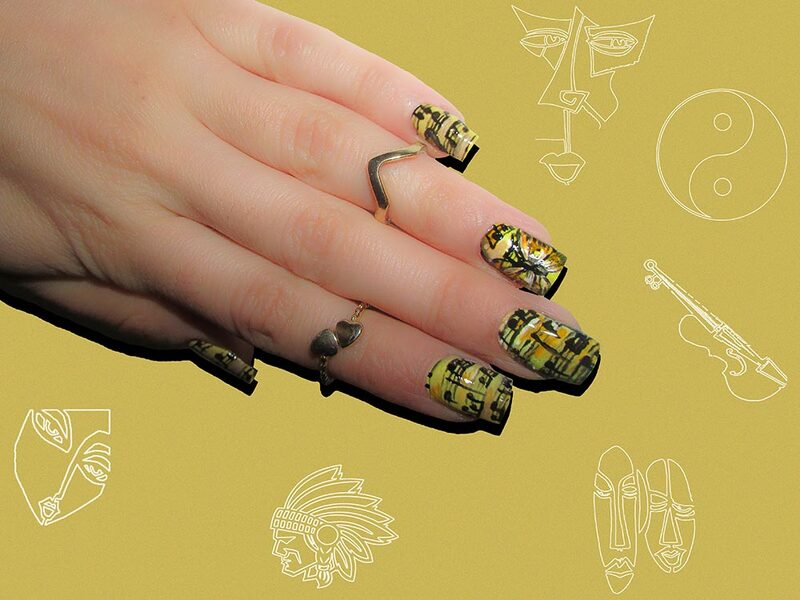 They are ubiquitous, stretching from nature to fashion arena to nail art design. Cover the nails with latticed canvas with pink-lavender accents while making two of them a field for blooming flowers. The best part of abstractionism is that it never ends. 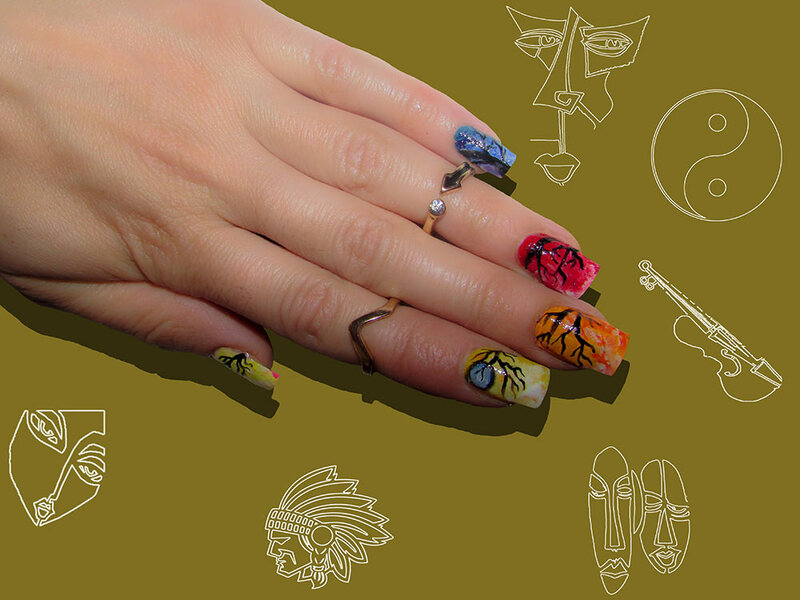 You can give free scope to your imagination and give birth to limitless number of artistic nail art designs. 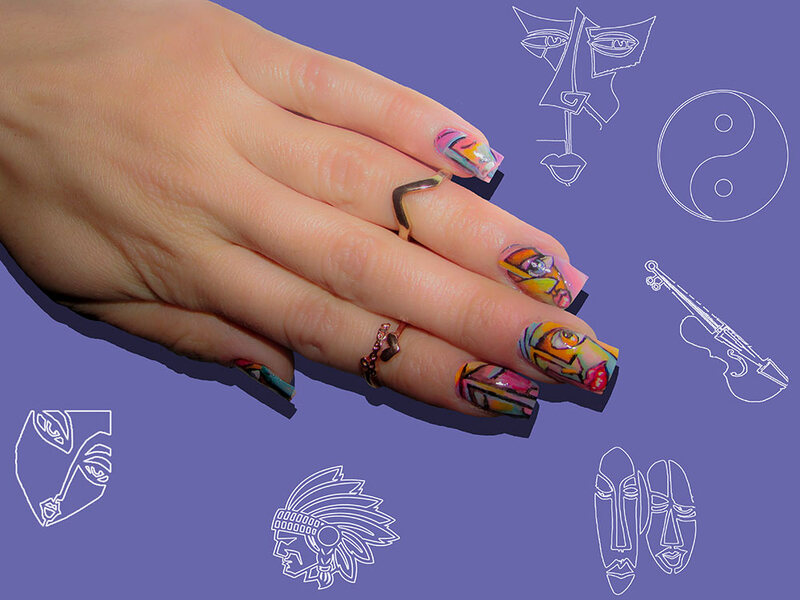 Give a try to this option illustrating graphic one-eye faces on three of the nails, keeping all the others wrapped with overlapping lines and colors. Want to set the world on fire? You can easily do it by means of your nails, covering them with a red-orange-yellow ombre effect evocative of blazing fire, where a slender ballerina girl is gracefully dancing on fire. Leafless spooky branches might as well be transferred to your nails and become quite artistic scenes when placed in the background of different blindingly bright colors. Coat each of your nails with yellow, bloody red, orange or blue paints with some marble effects to them and buckle down to draw many black leafless branches onto the vibrant nails.